Stunningly beautiful visual, music that touches souls, and emotional stories that touches hearts, these are the key elements of every single film produced by Shinkai Makoto, who in my opinion is one of the greatest anime directors of our time. Shinkai Makoto is among one of the very few anime directors that could manipulate human emotions with surgical precision. I would describe the feeling after watching this movie is "extremely depressed but not sad". Yes, it's a bit contradicting, but when a story is written and built properly, like Shinkai Makoto did, it's actually quite amazing that you can be depressed and feel the joy at the same time. The way he achieved, is through a sequence of very depressing events which is just enough to set the tone to be depressing, yet not enough to be full out tragedy. It is a very fine line to stay on, where it doesn't take much at all to overshoot or undershoot the target. Yet Shinkai Makoto manages to be right on it, every single time. 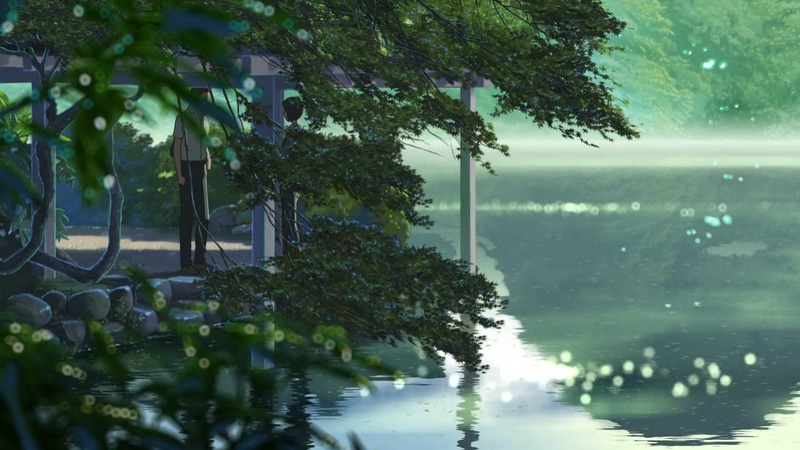 Another movies of his that I can clearly recall this feeling was "5 Centimeters per Second", where the joy was a bit less and depressing'ness was a bit more (actually, a lot more). Anyway, back to the movie itself, it's a very unusual story of love in a very unlikely situation. It's about a high school boy who wants to become a shoemaker skips school at each rainy day to go to a park to draw shoes. There, he met another person who is doing the same thing. The movie itself is rather short (about one hour), yet it actually felt heart-wrenchingly long, in a good way. In fact, I didn't even want the movie to end. I was hoping "please don't end here, let me see more, just a little more, I just want to know". As I read from some reviewers out there that they thought this is Shinkai Makoto's "next big thing" and was slightly disappointed after watching because of how "ordinary" it actually was. Maybe they are right to be disappointed in their mind. But, in my opinion, the ability to make an ordinary story extraordinary, is what separates him from the rest anime directors. He did it in 5 Centimeters per Second, and again here in Kotonoha no Niwa. His ability to make a story that you could finish reading in five minutes and completely forget in ten minutes become a highly memorable event is just unmatched. The bottom line is, I can't think of any reason anybody wouldn't want to watch this. So, go, find it and watch it, and any other work of his that you haven't seen, because every single piece of work by Shinkai Makoto is a masterpiece that everybody should see.